Blair Equipment, producers of tools that make precision holes in sheet metal and also spotweld cutter tools, has introduced a new line of annular cutters, the Rotabroach Extended Reach Cutters. The cutters are available in four popular diameters: 3/8, 7/16, 1/2 and 9/16″. The new cutters are also available in a convenient kit that contains all four cutter diameters in a molded plastic case for cutting edge protection, plus two pilots and a hex wrench. The kit is designed to keep the cutting tools handy and safe, ready for use — and includes safeguards for the precision-ground cutting edges. The Extended Reach cutters feature a single piece arbor/cutter construction and include a spring-loaded pilot for “popping out” the slug at the end of the cut. 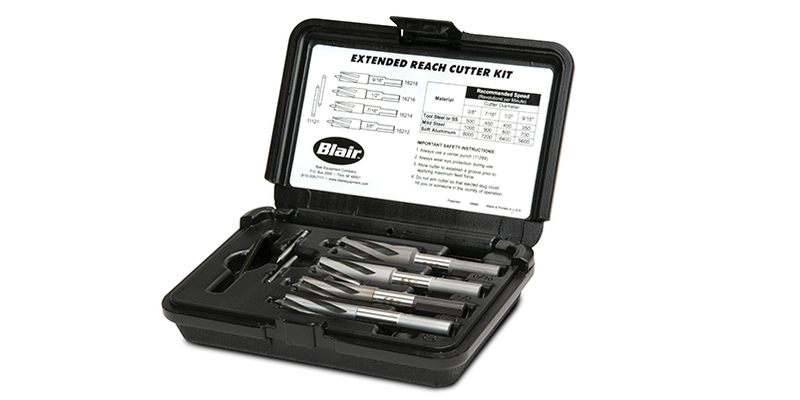 The cutters provide depths of cut of up to 1/4″ with a .80″ maximum flute length. The arbors of the Rotabroach Cutters fit 3/8″ and 1/2″ drill chucks on handheld drills or drill presses. The cutters’ design and tooth geometry, based on Blair’s other series of annular cutters, have demonstrated the ability to drill holes faster than twist, spade or indexable drills, plus they eliminate many secondary sizing and finishing operations including deburring. The hardened, precision-ground M2 H.S.S. tools also provide longer service life. The annular Extended Reach Cutters are hollow, meaning most of the hole remains a solid slug. The smaller cutting area at the periphery of the hole, with no center point or dead zone as with typical drills, allows faster feed rates while requiring less thrust. The tools are made in the USA. For additional information regarding Blair products, click here.